This paper presents two elderly patients who had normal baseline renal function and had stenotic valvular lesions secondary to rheumatic fever and underwent aortic valve replacements with mechanical valves. Both patients developed acute renal failure after cardiac valve replacement procedures. The renal biopsies revealed acute granulomatous tubulointerstitial nephritis. The unique histologic features were tubular basement membrane (TBM) immune complex deposition detected by both immunofluorescence and electron microscopy and prominent multinucleated giant cells surrounding intact TBM. The temporal relationship to the surgical procedure and the subsequent recovery of the patients’ renal functions upon therapy suggested that the renal failure may have been due to an allergic drug reaction from the perioperative exposure to unknown agents, such as prophylactic antibiotics and furosemide. The literature on TBM immune complex deposition was reviewed, and the pathophysiologic mechanisms that may account for the similarities between the clinicopathologic features of these two cases were examined. These two cases expand the histopathologic spectrum of previously described cases of putative drug-induced acute tubulointerstitial nephritis. We present two elderly patients who underwent cardiac valve replacement surgeries secondary to rheumatic heart disease. Both patients had normal renal function before the surgical procedure but developed acute renal failure afterward. Their renal biopsies revealed a unique combination of morphologic findings, which featured acute interstitial nephritis with tubular basement membrane (TBM) immune complex deposition and prominent tubulocentric multinucleated giant cell reaction with destruction of tubular segments. On the basis of the rapid onset of renal failure after the surgical procedures and the subsequent recovery of renal function, we postulate that an allergic drug reaction secondary to the perioperative exposure to an unknown agent is the explanation for the pathologic findings. In contrast to most forms of drug-induced acute tubulointerstitial nephritis (TIN), in which the majority of patients fully recover renal function, these patients experienced chronic renal insufficiency as a result of the destructive tubulitis. This 77-yr-old man with a history of hypertension, gastroesophageal reflux disease, and benign prostatic hypertrophy underwent an aortic valve (27 mm St. Jude) replacement for symptomatic stenosis secondary to rheumatic heart disease. The aortic valve showed fibroelastic thickening and myxoid degeneration without evidence of endocarditis. His baseline serum creatinine was 1.1 to 1.2 mg/dl, and a preoperative urinalysis was negative for cells or protein with trace positivity for blood and leukocyte esterase. His serum creatinine rose to 2.1 mg/dl on postoperative day 5, which was presumed to be due to acute tubular necrosis from hemodynamic changes during surgery. After being discharged on postoperative day 10, his creatinine remained persistently elevated at 2.6 mg/dl on day 19, and he was readmitted. His oral furosemide, which had been started postoperatively for edema, was discontinued. The patient was given a blood transfusion and intravenous fluids. Despite optimization of hemodynamics and a slight decline in serum creatinine to 2.4 mg/dl (day 20), his creatinine peaked at 3.3 mg/dl on day 25 after surgery. The patient’s medications included metoprolol, lansoprazole, imipramine, tamsulosin, heparin, oral iron, and oxycodone. New medications included tamsulosin, replacing terazosin; metoprolol, replacing losartan; oral furosemide, which was recently discontinued; and perioperative antibiotics (1 g of vancomycin). His physical examination was unremarkable; specifically, there were no signs or symptoms suggestive of embolization, systemic lupus erythematosus, or Sjögren syndrome. Serologic evaluation uncovered a positive anti-neutrophil cytoplasmic antibody at 1:165 with peripheral nuclear staining; anti-nuclear antibodies, anti-Sjögren syndrome A antibodies, and serum and urine protein electrophoresis were negative. C4 complement component was 10 mg/dl (normal range 10 to 37 mg/dl), and C3 complement component was 76 mg/dl (normal range 87 to 247 mg/dl). Urine eosinophils were present, but urine microscopy was bland except for a few normal red blood cells. The renal biopsy that was obtained on postoperative day 32 consisted of renal cortex and medulla with three to seven glomeruli for light microscopic evaluation per level section, of which two to four were completely sclerotic. The remaining intact glomeruli had no significant pathologic abnormalities. The interstitium demonstrated a prominent inflammatory cell infiltrate, composed of lymphocytes, histiocytes, plasma cells, and aggregates of eosinophils and interstitial edema. Large multinucleated giant cells surrounded the intact TBM (Figure 1). There was no evidence of vasculitis, and no microorganisms were identified in the periodic acid-Schiff or Jones methenamine silver stains. Patient 1. Prominent multinucleated giant cell formation surrounds intact tubular basement membranes (TBM) with many lymphocytes, plasma cells, and occasional eosinophils (Jones methenamine silver stain). Immunofluorescence microscopy revealed that approximately 20% of the TBM demonstrated granular and clumpy to confluent staining for IgG (2+/4+), C3 (3+/4+), C1q (focal 1+/4+), and κ and λ light chains (2+/4+; Figure 2). In contrast, there was no significant staining of glomeruli for IgG, IgA, IgM, C3, C1q, κ or λ light chains, fibrinogen, or albumin. Patient 1. Immunofluorescence microscopy for IgG shows strong granular to focally confluent staining along the TBM. The staining patterns for C3 and κ and λ light chains were similar (data not shown). Electron microscopy confirmed the presence of numerous discrete immune-type electron-dense deposits in the TBM (Figure 3). Macrophages were present abutting the immune complex–laden TBM. As expected, the glomeruli revealed no evidence of immune-type electron-dense deposits or other significant pathologic findings. Patient 1. Electron microscopy demonstrates numerous electron-dense deposits (arrows) along the TBM. Note the macrophage surrounding one tubule and its dense deposits. Magnification, ×8400. The patient was treated with oral prednisone at 1 mg/kg per d for 1 mo and then tapered to 0.5 mg/kg per d. After 1 and 4 wk, his serum creatinine was 2.6 and 2.0 mg/dl, respectively. After 6 wk of treatment, his serum creatinine was 1.8 mg/dl, and he is doing well. This 65-yr-old Athabascan woman with a history of rheumatoid arthritis and rheumatic fever with valvular heart disease underwent an elective aortic valve replacement. She had a history of a mitral valve (St. Jude) replacement in 1995 for rheumatic valvular disease. The aortic valve showed degenerative changes without evidence of endocarditis. Her rheumatoid arthritis was treated with nonsteroidal anti-inflammatory agents but did not require immunosuppressive therapy. Her medical history included hypertension, valvular congestive heart failure with an ejection fraction of 20 to 25%, chronic atrial fibrillation, and malnutrition. The surgical placement of a mechanical aortic valve (Carbomechanics #21) and a tricuspid valve ring (30 mm Edwards model 4900) was uneventful. Preoperatively, the serum creatinine was 0.8 mg/dl, and the patient had a negative urinalysis. After surgery, the patient developed acute renal failure with hematuria, pyuria, and proteinuria. Her postoperative serum creatinine was 1.7 mg/dl by day 2 and increased to 4.2 mg/dl at day 7, and she developed anuria by day 9. Her medication exposures included dobutamine, famotidine, ketorolac, cefuroxime, dopamine, midazolam, Coumadin, atenolol, and aspirin. A serum antinuclear antibodies level was 1:320, and serum levels for C3 and C4 complement components were low. There were no other signs or symptoms of systemic lupus erythematosus or Sjögren syndrome. The renal biopsy that was obtained on postoperative day 17 contained renal cortex and medulla, with approximately 11 to 17 glomeruli per level section. Up to two glomeruli were globally sclerotic. The remaining glomeruli demonstrated no significant abnormalities. The interstitium was markedly expanded by edema and a dense inflammatory cell infiltrate composed of lymphocytes, histiocytes, plasma cells, clusters of eosinophils, and multinucleated giant cells. The giant cells predominantly surrounded intact TBM (Figure 4). Some tubules exhibited sloughed epithelial cells and prominent tubulitis. No vasculitis was identified, and no microorganisms were present in the periodic acid-Schiff or Jones methenamine silver stains. Patient 2. Many multinucleated giant cells engulf intact tubules accompanied by prominent interstitial inflammation (Jones methenamine silver stain). Immunofluorescence microscopy revealed a clumpy to confluent staining of TBM for IgG (3+/4+), C3 (trace/1+), and κ and λ light chains (3+/4+; Figure 5). There was no significant glomerular staining for IgG, IgA, IgM, C3, C1q, κ and λ light chains, fibrinogen, or albumin. 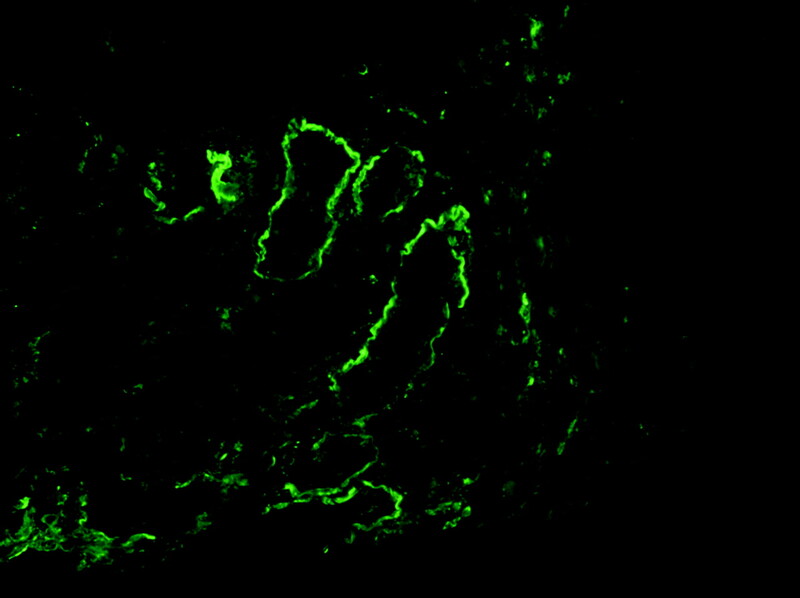 Indirect immunofluorescence staining that was performed with this patient’s serum on normal human kidney failed to identify anti-TBM antibodies (data not shown). Patient 2. Immunofluorescence microscopy for IgG (A) and C3 (B) reveals strong granular to nearly confluent staining along many of the TBM in a similar manner to patient 1. κ and λ light chains (data not shown) also were positive for patient 2. Electron microscopy demonstrated many small discrete immune-type electron-dense deposits in the TBM (Figure 6). Multinucleated giant cells were immediately adjacent to the TBM, with apparent phagocytosis of some of the electron-dense immune-type deposits (Figure 6, inset). 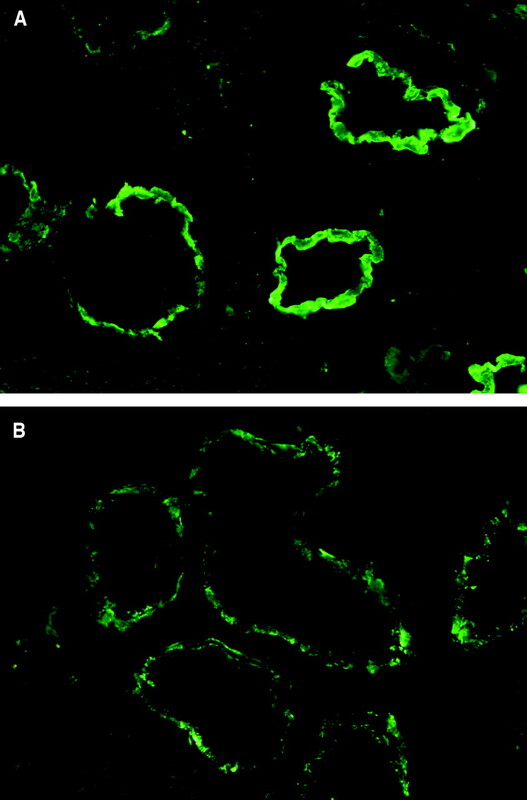 As anticipated, there was no evidence of immune complex deposition in the glomeruli, and tubuloreticular inclusions were not identified in the endothelial cells. Patient 2. Electron microscopy demonstrates numerous electron-dense deposits (white and black arrows, inset) within the TBM. Note the macrophage surrounding one tubule and its dense deposits. Magnifications: ×4400; ×20,000 in inset. The patient was treated with mycophenolate mofetil (500 mg twice daily) and prednisone (20 mg/d). During her hospitalization, she developed a delayed transfusion reaction that resulted in hepatitis and a severe hemolytic anemia and a plethora of autoantibodies to many blood antigen groups. She was discharged 4 wk after the initial surgery on chronic hemodialysis. Her prednisone was tapered rapidly over 6 wk. She remained dialysis dependent for 2 mo and then stopped dialysis because of her improving renal function with a baseline creatinine of 2.2 mg/dl. Mycophenolate mofetil was discontinued after 3 mo as a result of anemia and gastrointestinal complaints. During the next 6 mo, the patient had slowly deteriorating renal function complicated by severe congestive heart failure (ejection fraction of 15%) and was restarted on dialysis for volume control. The two cases presented herein demonstrate a unique constellation of morphologic findings in an unusual clinical setting, which has not been described previously. Acute TIN has been reported in approximately 7% of elderly patients with acute renal failure (1). Typical features of drug-induced TIN include extensive tubular epithelial cell injury and TBM disruption with giant cells or granulomata associated with TBM or alone in the interstitium (2). Linear immunofluorescence staining of the TBM has been reported in 9.5 to 17% of cases of drug-induced TIN (3). Discrete TBM immune complexes are rarely identified in the absence of glomerular involvement, with the primary exceptions being systemic lupus erythematosus (4) and Sjögren syndrome (5), in which TBM immune complex deposits have been reported in the setting of minimal glomerular deposits. Patient 2 had a positive antinuclear antibodies titer, but neither patient had a clinical presentation of systemic lupus erythematosus or Sjögren syndrome. Recently, Kambham et al. (6) described a new entity called idiopathic hypocomplementemic TIN with TBM immune complex deposits, which occurs predominantly in older mens. Both of our patients were elderly and mildly hypocomplementemic, but their unusual clinical similarities (heart valve replacement surgery for rheumatic heart disease) and the prominent peritubular giant cell reaction distinguish our cases from the reported cases of idiopathic hypocomplementemic TIN. For patient 2, we were able to exclude the presence of circulating anti-TBM antibodies. In addition, patients with anti-TBM antibodies do not have corresponding electron-dense deposits by electron microscopy, further arguing against the presence of these antibodies in patient 1. Although patient 2 did demonstrate an elevated serum creatinine by postoperative day 2, this most likely was due to acute tubular necrosis, which is a common postsurgical complication particularly given this patient’s history of congestive heart failure and low ejection fraction. For both patients, the delayed and prolonged renal insufficiency correlated with the renal biopsy evidence of giant cell tubulitis and TBM immune complex deposition. These pathologic findings suggest that an immune-mediated (allergic) reaction is the underlying cause of the destructive interstitial nephritis. Giant cell tubulitis is a unique reaction to TBM immune complex deposits that has not previously been appreciated in renal biopsies. In this report, the multinucleated giant cells are reacting to TBM immune deposits, resulting in a destructive tubulitis with multinucleated giant cells engulfing immune deposits and remnants of tubular segments. 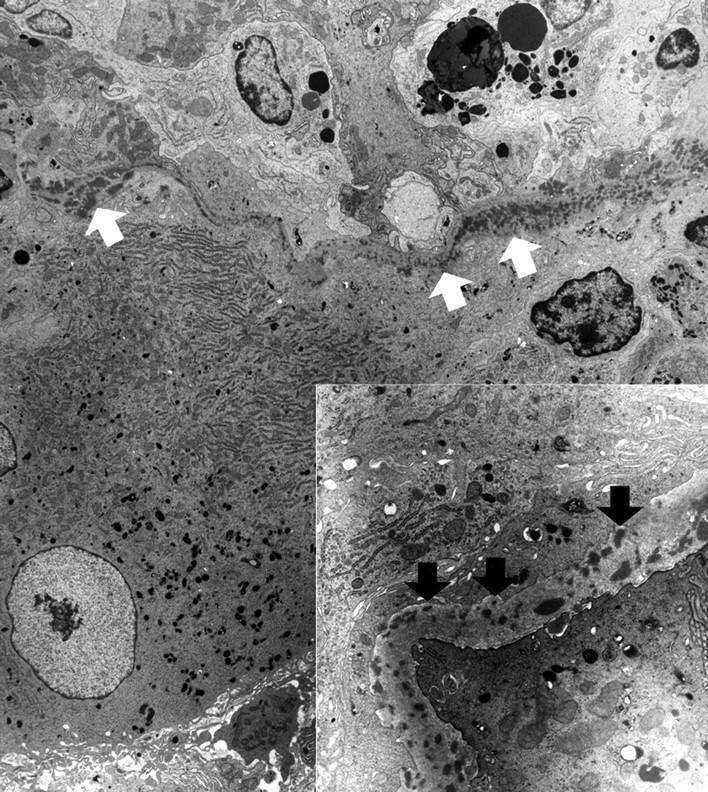 Electron microscopy shows many macrophages with pseudopodia intimately wrapped around the TBM and granular electron-dense deposits, which also are within the cytoplasm of macrophages, demonstrative of the macrophages’ role in the clearance of immune complexes (Figure 6). Although TBM immune complex deposition can be present in lupus nephritis and several other immune complex–mediated glomerulonephritides, granulomatous inflammation with prominent peritubular multinucleated giant cell formation has not been reported in these settings. 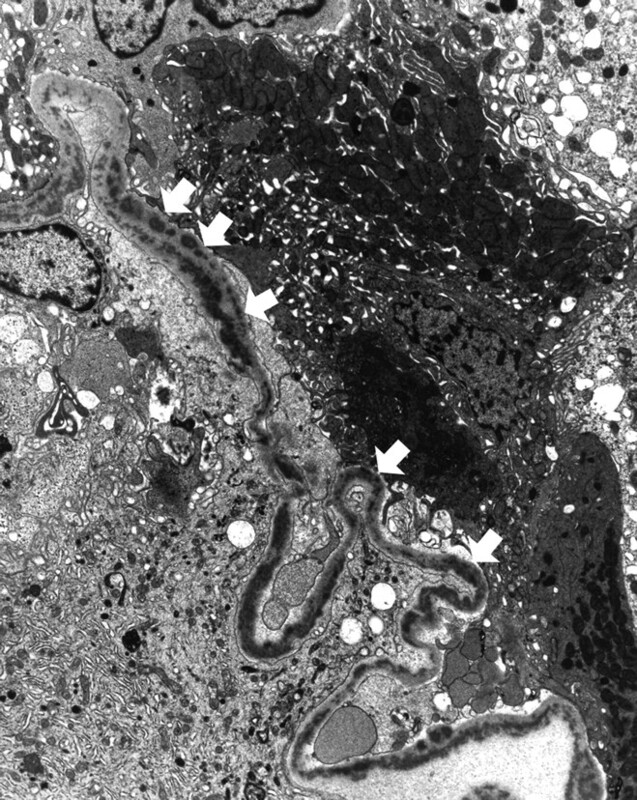 The rare combination of these histologic features was reported previously in light chain deposition disease and amyloidosis (7). One might also include myeloma cast nephropathy, but in this instance, the giant cell reaction is associated with the intratubular “myeloma” casts. Anecdotally, we have seen a case of fibrillary glomerulonephritis with TBM deposits and peritubular giant cell reaction. 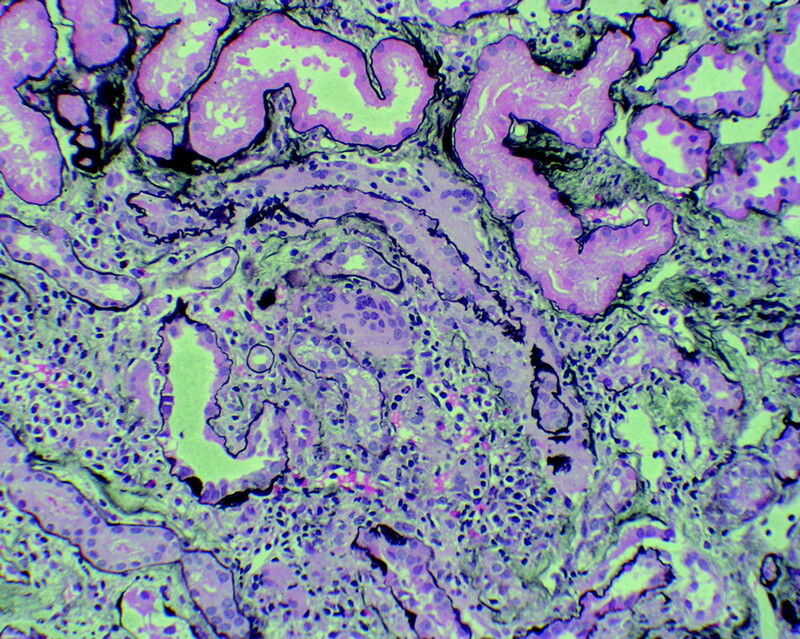 However, in light chain deposition disease, amyloidosis, and fibrillary glomerulonephritis, there is prominent glomerular involvement with deposits that have characteristic ultrastructural features. The possible pathogenic mechanisms of TBM immune complex formation, based on animal and human studies, have been reviewed in detail by Rossert (8) and Wilson (9). Circulating immune complexes may be formed by the drug and antidrug antibodies and deposited in the TBM and/or the interstitium. Anti-TBM autoantibodies may form after exposure of TBM antigens to the immune system as a consequence of either hapten binding or tubulointerstitial inflammation, leading to exposure of previously hidden basement membrane antigens and subsequent autoantibody production (8). The latter mechanism is more consistent with the finding of predominantly linear Ig binding along the TBM in drug-induced TIN. Certain drug exposures, including methicillin and penicillin, can lead to haptenation of TBM proteins, yielding the subsequent in situ formation of TBM immune complexes and associated granulomatous TIN (10,11). Indeed, anti-TBM and anti-hapten antibodies have been detected in the sera of patients with drug-induced TIN, and the corresponding presence of haptens on the TBM also has been identified (10,11). The reaction pattern that we describe in this article has been replicated to a degree in one animal model. Rennke et al. (12) injected the hapten azobenzenearsonate into rats that were preimmunized with azobenzenearsonate-keyhole limpet hemocyanin, and a granulomatous inflammatory reaction developed around the tubules. This latter histologic pattern developed without the presence of detectable TBM immune complexes or hapten binding, suggesting that activation of cellular immunity alone accounted for this granulomatous reaction pattern. Although there are some similarities, these animals do not entirely reproduce the pathologic findings that are present in our two patients, who had TBM immune deposits that were detected easily by immunofluorescence and electron microscopy and presumably were the initiating components of the observed inflammatory reaction. One unusual aspect of both patients is the remote history of rheumatic heart disease. Acute rheumatic fever represents a unique immunologic response to a subgroup of streptococcal antigens (13). A subset of patients can develop either poststreptococcal glomerulonephritis or rheumatic heart disease. Infrequent cases of patients who developed both have been reported (14,15). TBM immune complex deposits have been described in the setting of poststreptococcal glomerulonephritis (16), but it seems unlikely that both of our patients could have remnants of TBM immune deposits. A more likely scenario might be that these two patients have a similar genetic predisposition for inducing idiosyncratic immune responses to pharmacologic agents that resulted in the unique morphologic findings described above. We describe two patients who had acute renal failure after cardiac valve replacement surgery and developed a histopathologically unique TIN with TBM immune deposits and associated multinucleated giant cells. The clinical correlation strongly supports an unusual immunologic response to an offending agent as the underlying cause of their acute renal failure, although the pathogenic mechanism of this process remains poorly understood. The recognition of this unique histologic variant of acute TIN warrants aggressive clinical intervention to limit chronic sequelae to the destructive immune complex–mediated renal injury.